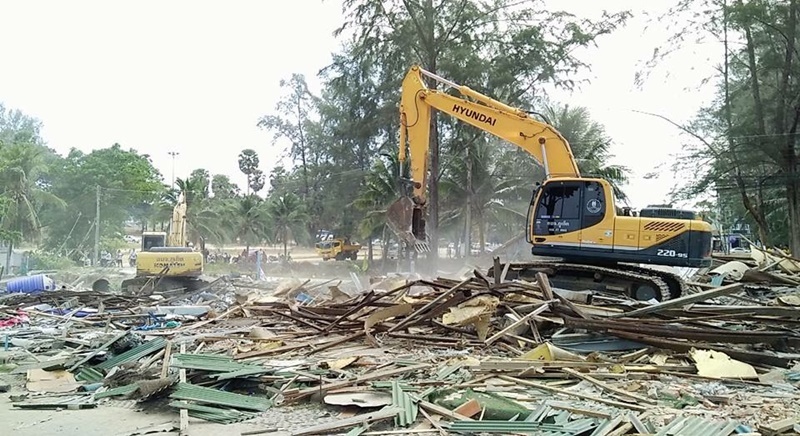 OrBorTor chief MaAnn Samran told The Phuket News this morning( Apr 22) that officials from his office are now working on cleaning up the area and it is likely that the cleanup will be complete within a week. Mr MaAnn said, “Right now we have two backhoes supplied by the Provincial Administration Organisation (OrBorJor) and several six-wheeler trucks and cranes working on-site. “Most of the debris is large and cannot be moved by hand so we have had to rely on heavy machine which is a lot faster. Hopefully workers will finish the cleanup in one week. After all the debris has been cleared from the site we will clean up and resurface the land to make it attractive,” he said. “We did not put up signs to keep people out of the area as we believe residents and tourist know what is going on and not to come near the site. A few people have come close to the site, but only to take photos,” Mr MaAnn added.